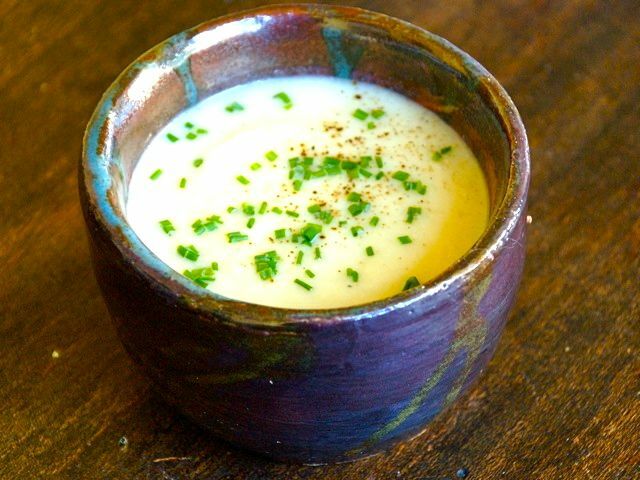 This creamy soup uses five of the best winter vegetables, and it's very easy to make. Don't worry about precise quantities, but use the list here as a rough guide. At the last minute, peel the celery root thickly so that you're left with just the white flesh (like a banana, celeriac turns brown very quickly once it's been cut). Chop this into cubes and add to the pan with the cauliflower and potatoes as well as the stock, a pinch of salt, and a twist of pepper. Stir well and bring to a boil, then reduce the heat and simmer gently until the vegetables are tender; 15 minutes should be enough. Return the soup to the pan, stir in the cream, and reheat gently but thoroughly. It doesn't need to boil again, but it should be piping hot. Check the seasoning and add more salt and pepper if necessary.